The Smith River provides Steelhead, Trout and salmon fishing which is a favorite pastime here. 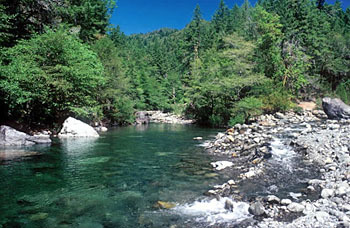 The Smith River provides water to the forest and the wildlife it contains. Because the Smith River is one of the last major free flowing rivers in California, it is clean, clear and a natural spawning ground for the native fish. Nearby fishing trips along the Smith River, fishing guides, also offers Kayak rentals, and shuttle service is available. There are no motorized boats allowed on the Smith River because it has a Wild & Scenic River designation, so it is a favorite for swimming and rafting as well..
Kayaking and Rafting are favorite pastimes along the Smith River. Hiouchi Cafe is right along the river. There are Local Rentals and Guide Services available also Ranger-led Kayak Programs. 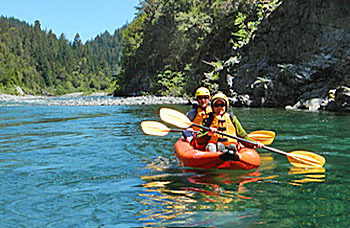 For a limited time in summer, Redwood National and State Parks presents kayak tours of the Smith River, a crown jewel of the National Wild & Scenic River System and the largest free-flowing river system in California. Led by experienced park rangers, visitors will explore a variety of topics, including the unique geology of the Smith River watershed and how it contributes to the growth of the world's largest trees, all while paddling pristine waters and enjoying unparalleled scenery. Hiouchi Cafe is close to Jedediah Smith Redwoods State Park. This 10,000 acre park is comprised of predominately old growth Redwoods and is bisected by the last major free flowing river in California, the Smith River. Though the park is predominantly Redwoods, Conifers such as Sitka Spruce, Western Hemlock, Grand Fir, Douglas Fir, as well as the less common Port Orford Cedar can all be found with the parks boundaries. The ground cover is dense and a wide range of plants including shrubs, bushes, flowers, ferns, mosses and lichens line the pathways off the Redwood trails. Hiking and fishing is a favorite pastime for locals and visitors alike. Established as a state park in 1929, The park is named after the first white man to explorer the interior of Northern California, Jedediah S. Smith..
Trailhead: Marked trailhead is just before west end of Hiouchi Bridge on Hwy 199. Summer seasonal footbridge allows access from Jedediah Smith Campground. Trail can also be accessed via Hatton Trail off Hwy 199. This is a 2 mile trail with Moderate, non-level grades, not steep. A delightful hike along the pristine turquoise Smith River, this trail provides views of both riparian (near-stream) forest and old-growth redwoods. California bay, tanoak, Douglas-fir, and Pacific Madrone abound, while salal, huckleberry, and thimbleberry draw in wildlife during the late summer and fall months. Spectacular views make this trail a favorite among visitors and rangers alike. This local area borders Oregon & California. 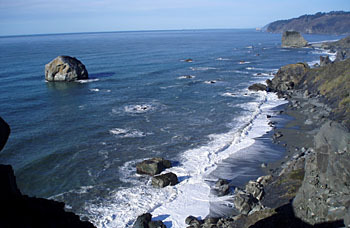 Both along the Coastline, providing a variety of beaches and coastal scenery. Walk along the beach and enjoy the wildlife and beautiful sunsets. There are many parks in the area to see along with the Coastal Redwoods, the mighty Sequoia's, are the tallest living things in our world, some growing to 350 feet and beyond. The ancient Redwoods were here when dinosaurs roamed the earth. Sixty-five million years later we can now stroll through these living artifacts and marvel at their beauty as they tower over us. 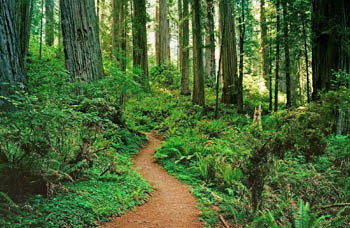 The Redwood's life spans are about 800-1500 year, some older. Trees of Mystery is a roadside attraction 36 miles south of the Oregon border, in Klamath, California. This private enterprise, founded in 1931, is located adjacent to US Highway 101 on private land surrounded by Redwood National and State Parks. 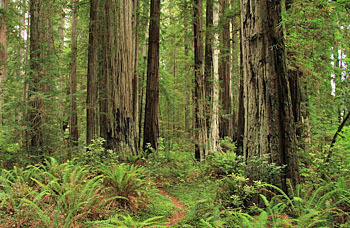 The property contains towering redwoods and a number of unique tree formations, many of which can be seen from the "Trail of Mysterious Trees." The "Trail of Tall Tales" features some 50 chainsaw sculptures and carvings illustrating the imaginative stories about Paul Bunyan and his logging crew. The "Cathedral Tree", nine trees growing in a semicircle out of one root structure, is sometimes used for outdoor weddings. 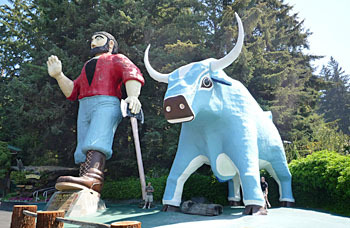 There is a 49-foot-tall statue of Paul Bunyan and the 35-foot-tall Babe the Blue Ox. An aerial tramway, called Skytrail, takes visitors to an observation deck where they can enjoy a view of the Pacific Ocean and surrounding forest. .
Taken of local area, Smith River, redwoods, Hwy and road.